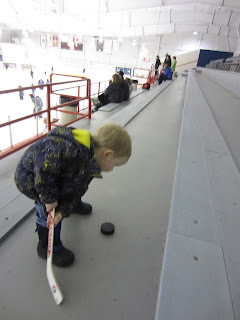 Through the winter, Pk took the Pre-Canskate programme and loved it. She adored it so much that when we got the application for the spring session, we decided to keep going. Pk was so excited, that is, until we got there tonight and were on a different ice pad and she didn't see her favourite teacher. I could see that she was becoming rather scared. Then, we heard her name being called. It was her favourite friend from the last session. They ran to hug and just talked and talked. Once they got on the ice, they stuck together the entire time, several times getting separated from the rest of the group, since they were more focused on each other than on the instructor. It really makes me happy when I see Pk getting such pleasure from friends. It makes me think of all of the joy I have gotten from the special people in my life and I love the fact that, at least up until now, she seems to have an ease with people and a capacity for friendship that could really enrich her life. I hear so many stories of "mean girl" situations - it's so nice to see the wonderful side of girls together. And Lb? He took a hockey stick with him in the car and found at puck when we arrived. Life was good for him, too!